A small group of tents stands quietly on the festival-grounds. At night, the tents come alive and reminisce the events of the past days. 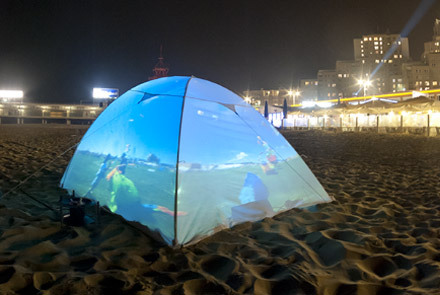 Instead of showing what's happening inside the tent, the tents show 360 degree panoramic imagery projected from within each tent. The 360 degree panoramic images are shot during the festival, or they can be taken from a large collection of festival panoramas such as those taken at the Sziget festival. SummerDrea.ms uses tents generously provided by .